One remedy for an uncomfortable mosquito bite may also be one of your favorite breakfasts. Oatmeal can relieve itching and swelling because it contains special compounds that have anti-irritant qualities. Make an oatmeal paste by mixing equal amounts of oatmeal and water in a bowl until you have a spackle-like substance. Spoon some paste onto a washcloth and hold it, paste-side down, on the irritated skin for about 10 minutes. Then wipe the area clean. If you have many bites, try an oatmeal bath instead. Sprinkle 1 cup of oatmeal or ground oats into a bathtub full of warm water. Soak in the oatmeal bath for 20 minutes, occasionally rubbing some of the clumped oatmeal onto irritated areas of your skin. Cold temperatures and ice can reduce inflammation. The cold also numbs the skin, which can give you immediate but short-term relief. The Mayo Clinic recommends using a cold pack or a bag filled with crushed ice to relieve the itching caused by a mosquito bite. Don’t leave the ice directly on your bite for more than five minutes as it can damage the skin. You can also put a barrier, such as a washcloth, between your skin and the ice so you can leave the ice on the bite longer. This sugary sweet substance is a common pick among home remedy enthusiasts because it has many antibacterial and anti-inflammatory properties. It has been used for hundreds of years as a treatment for ailments like sore throats to bumps and bruises. A small drop on an itchy bite can reduce the inflammation. And it will reduce your temptation to itch, as itching skin covered in honey can create a sticky mess. A common household plant, aloe vera has many uses beyond shelf decoration. The gel has been shown to have anti-inflammatory properties, and can help to heal minor wounds or calm infections. That’s why it may be a good bet for healing a bug bite, too. To try this, cut open a small section of the plant. Apply the plant’s gel to the area that’s irritated. Let it dry, and apply again as needed. Found in virtually every kitchen, baking soda has a multitude of uses — from baking bread to clearing drains. Otherwise known as sodium bicarbonate, baking soda may also provide relief from a mosquito bite. It’s easy to make a baking soda paste, and you can use it in a similar manner to oatmeal paste. Mix 1 tablespoon of baking soda with just enough water to create a paste. Apply it to the bug bite, and let it sit for 10 minutes before washing it away. The fragrant basil plant is a key ingredient of many of your favorite Italian recipes, but it does double duty as a mosquito bite remedy. Studies suggest that a chemical compound called eugenol, which is found in basil, could relieve itchy skin. To make a basil rub, boil 2 cups of water and add half an ounce of dried basil leaves. Leave the mixture to steep until it’s cool. Then dip a washcloth into the liquid, and rub it gently on your mosquito bites. Alternately, you can chop some fresh basil leaves up until very fine, and rub them on to your skin. For centuries, apple cider vinegar has been used as a natural remedy to treat many medical conditions, from infections to blood glucose problems. If you have an itchy bite, dab a drop of vinegar on it. The vinegar can help reduce stinging and burning sensations. It can also act as a natural disinfectant if you’ve been scratching too much. Not only can onions bring tears to your eyes, they can bring relief to your mosquito bites. The onion’s juices, which leak out from the freshly cut bulb, can reduce the bite’s sting and irritation. Onions also have a natural antifungal property that can reduce your risk for an infection. Cut a slice from an onion — the type doesn’t matter — and apply it directly to the bite for several minutes. Rinse and wash the area well after you remove the onion. The petite leaves of the thyme plant are delicious on potatoes, fish, and more. They may also help ease the itching of a mosquito bite. Thyme has antibacterial and antifungal properties, so it can help reduce your risk of irritating and infecting the skin around a mosquito bite. To get the most benefit from thyme, finely mince the leaves. You can apply the leaves directly to your bite, and let them sit for 10 minutes. You can also make a concentrated liquid by bringing water to boil, and adding several sprigs of thyme. Let the sprigs steep until the water is cooled. Then dip a washcloth into the thyme-infused water, and apply to the bites. Leave the washcloth in place for a few minutes. For extra relief, wrap the thyme-soaked washcloth around an ice cube for a natural cooling effect. Lemon balm is a leafy plant that’s closely related to mint. The herb has been used for centuries as a soothing all-natural treatment for everything from anxiety to upset stomach. For mosquito bites, you can apply finely chopped leaves directly to the bite, or you can buy a lemon balm essential oil. Lemon balm contains tannin, a natural astringent. In addition, lemon balm contains polyphenols. Together, these natural compounds ease inflammation, speed up healing, and reduce the risk of an infection. Witch hazel is a natural astringent you can buy over the counter in pharmacies and grocery stores. Like lemon balm, witch hazel contains tannins, which act as astringents when applied to the skin. Used alone, witch hazel is beneficial for any number of skin irritations, from minor cuts and scrapes to hemorrhoids. Applying witch hazel to the skin reduces inflammation, soothes the burning and irritation the bite causes, and can speed up healing. Apply a small amount of witch hazel to a cotton ball. Gently dab or swipe it over the bite. Allow it to dry. Repeat this as needed. Chamomile, which is a member of the daisy family, is a common natural remedy for many ailments. When applied to skin, the tea can reduce inflammation, ease skin irritation, and speed up healing. Steep a tea bag filled with the dried, crushed flowers in water in a refrigerator for 30 minutes. Then squeeze any excess water from the tea bag, and apply it directly to your bite. Let it sit for 10 minutes. Wipe the area clean with a wet rag. You can chill the tea bag in the fridge for additional applications later. Garlic is a well-known natural remedy for conditions from heart disease to high blood pressure. While more conventional treatments may be preferred for those serious conditions, a bit of garlic applied to an irritating bug bite is an easy home remedy for a mosquito bite. But before you slice into a bulb and apply it to your bite, know that applying cut garlic straight to a skin wound or bite may cause burning and stinging. Instead of that, finely mince up fresh garlic and stir it in with an unscented lotion or room temperature coconut oil. These ointments and creams will help reduce the garlic’s potency but still allow you to get relief from the garlic’s natural anti-inflammatory and antibacterial effects. Let the mixture sit for 10 minutes, then wipe it off your skin. Wipe the area down with a cool washcloth. Apply more later if the itching persists. 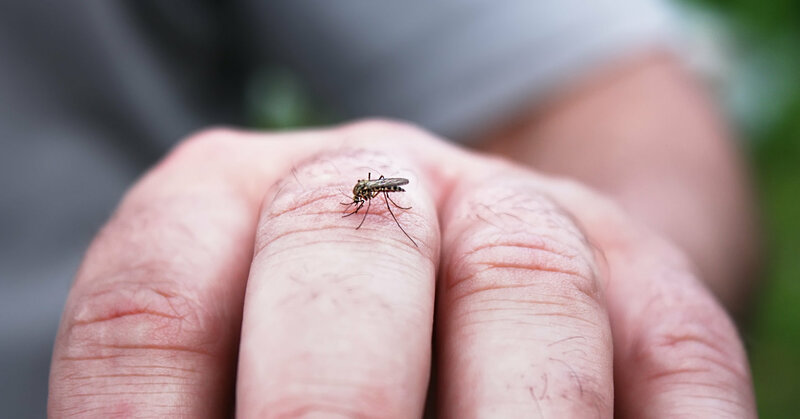 Of course, the best way to get rid of mosquito bite irritation is to avoid a bite altogether. Keep in mind that these insects are more active in the evening and at night. If you want to enjoy a summer evening outdoors but fear the petite blood-sucking bugs, cover your skin and stay away from standing water to reduce your exposure. If you are bit, quickly stop the swelling and itching with a safe, cost-efficient homemade remedy.